Manali The Food Destination of..
Kasol The Little Israel and..
Kullu is also Known as the ‘Valley of Gods’, Kullu is a cluster of beautiful valleys in Himachal Pradesh. Located between the majestic Himalayas and river Beas. Kullu is situated at an altitude of 1230m. Kullu, along with Manali, are favorite hill stations with tourists especially honeymooners. Scenic views and snow-clad mountains, towering Deodar jungles, rivers and apple orchards have attracted several people. Kullu is a hot-spot for adventure sports. Trekking, river rafting, mountaineering, paragliding and hiking over the Himalayan glaciers are some of the activities that Kullu offers. 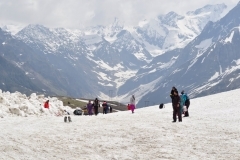 Manali is one of the best honeymoon destinations of India. Manali is located at northern end of Kullu valley. All major Sightseeing of Kullu like Pandoh Dam, Prasher Lake, Himalayan National Park and all Religious Places Like Hanogi Mata Temple and Bijli Mahadev. All Sightseeing and Major Attractions of Manali like ,Hadimba temple, Manu temple, Vashisht Bath, Van Vihar, Tibetan Monastery, Rohtang pass. Click here to book Manali Hotels - best deals..
Start the tour from Chandigarh and proceed to Kullu. It is around 271 km and take 6-7 hours to complete journey. The journey is too long so we will break journey at Sundernagar. Have lunch and some rest there, proced to Kullu. After arrival check into hotel and overnight stay at hotel. After breakfast visit some local sightseeing of Kullu Like Pandoh dam, Great Himalayan National Park and Bijli Mahadev temple. In between your visit have lunch at Hotel The Nest and some rest there. After that came back to hotel, Rest of the day is for your Lesiure and overnight stay at hotel. Pandoh Dam: The Pandoh Dam is an embankment dam built on the Beas River in Mandi district and is located at a distance of 10 km from Manali. This dam is a part of a run-of-the-river power design and it diverts the water of the Beas to the southwest through a system of tunnels and channels. The water of the dam is used for power generation at the Dehar Power House before it is discharged into the Sutlej River. The Pandoh Dam is set up in a beautiful surrounding and the manmade lake created by the dam draws people to it. Located en-route to Manali from Kullu. Himalayan National Park: The Great Himalayan National Park is also known as Jawaharlal Nehru Great Himalayan National Park. Spread over an area of 765 sq km, it is home to over 31 species of mammals and 181 species of birds. National park also serves as home to 3 species of reptiles, 9 species of amphibians, 11 species of annelids, 68 resident bird species and 50 migrant bird species. After breakfast visit some other sightseeing of Kullu like Raghunath Temple, Hanogi Mata Temple and Prasher Lake. In between your visit have lunch and some rest at Hotel Ramneek. Rest of the day is for your leisure after that came back to hotel and overnight stay at hotel. Raghunath Temple: Raghunath Temple, constructed by Rajah Jagat Singh in 17th century, is the oldest temple in the valley. The story behind the construction of this temple is that when a Brahmin was found in the valley with lots of pearls, Rajah ordered his men to take them away from him. Subjected to torture, which he found unbearable, the Brahmin locked his entire family in his house and set it on fire. Rajah was very depressed with this event and felt guilty about what he had done to the Brahmin. To get over his guilt, he visited Shri Kishan Dass ji Paihari, who advised him to construct a temple of Lord Rama. On the advice of the sage, Rajah donated his entire kingdom to Lord Rama. Hanogi Mata Temple: Raghunath Temple, constructed by Rajah Jagat Singh in 17th century, is the oldest temple in the valley. The story behind the construction of this temple is that when a Brahmin was found in the valley with lots of pearls, Rajah ordered his men to take them away from him. Subjected to torture, which he found unbearable, the Brahmin locked his entire family in his house and set it on fire. Rajah was very depressed with this event and felt guilty about what he had done to the Brahmin. To get over his guilt, he visited Shri Kishan Dass ji Paihari, who advised him to construct a temple of Lord Rama. On the advice of the sage, Rajah donated his entire kingdom to Lord Rama. After breakfast check out from hotel and proceed to Manali. It is arround 40 km and take 1-2 hours. Manali is one of the best honeymoon destinations of India.After arrival visit some local sightseeing of manali like Hadimba Devi temple, Monastries,Vashisht Temple, Gompa and Manu Temple. In Between your Visit have lunch and some rest at Casa Bella Vista Resturant. After that check into hotel and overnight stay at Hotel. After breakfast Proceed for Chandigarh. It is around 271 km and take 6-7 hours to complete journey. The journey is too long so we will break journey at Sundernagar. Have lunch and some rest there, proced to Chandigarh. Our representative will drop you at Chandigarh Airport/Railway station. Bijli Mahadev: The another major attraction is Bijli Mahadev. Bijli Mahadev Temple is a huge temple that is dedicated to Lord Shiva. This temple is located at the height of 2,450 m above sea level offers beautiful view of nearby mountains and residential houses in the valley. Often called as the ‘Temple of Lightening’, this temple is famous among locals and tourists for the legend behind its Shiva Lingam. It is believed that the temple possesses a Shiva Linga, which had broken into pieces due to lightning. The broken pieces of the Shiva Linga were bound together by the temple priest using butter. This activity repeats itself once every year. Prasher lake: Prashar Lake is situated at a distance of 49 km from Mandi. This sacred beautiful lake is named after the great sage Prashar who is believed to have meditated in this region. Located at an elevation of 2730 m above sea level in a valley, this lake offers a 360 degree view of snow covered mountains. The depth of the lake is unknown but is considered to be very deep and has a floating island on it. Rahalla Falls: It is around 51 kms from Manali. Located at a height of 3980 m, the Pass once served as a crucial trade route, and still remains the gateway to the districts of Lahaul and Spiti.The Pass is open from June to November each year, and provides wonderful views of the entire surroundings. Just beyond the Pass is the Sonapani Glacier and the twin peak of Gaypan. The Beas Kund, the source of the Beas river, a holy site for Hindus, as the sage Vyas is said to have meditated at this spot, is also accessible from the Rohtang Pass.